Well, NPR is moving. Most everyone except Newscast, Digital News and Technical Operations has left the old building at 635 Massachusetts Avenue for the beautiful new headquarters building at 1111 North Capital Street. We, the stragglers go last- next week. 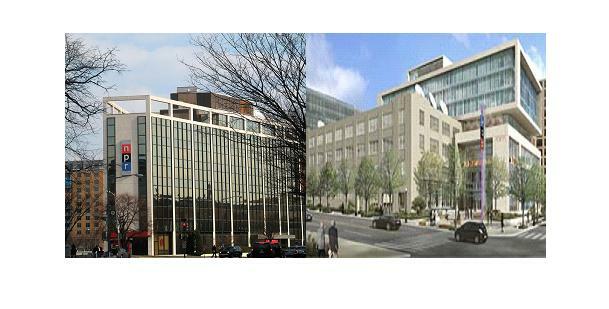 What will become of the old building that housed NPR for some two decades? It will be destroyed in just a few weeks; demolished and turned to dust. So….what do a few hundred snarky, already cynical NPR-types do to a building they know will cease to exist in a few short weeks? Graffiti! Big time Graffiti. 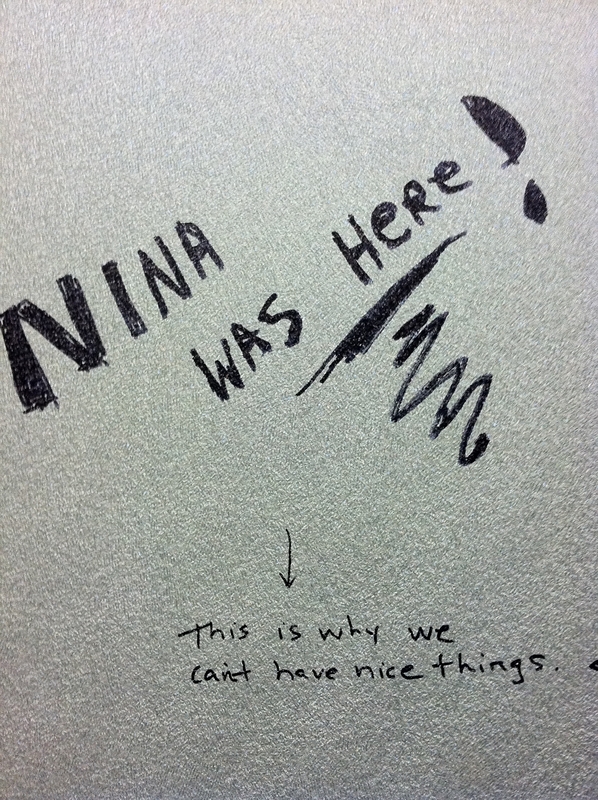 On all the walls, the elevators, the CEO’s old office bathroom. You name it. The entire place has been turned into a kind of performance art canvass where features of the building itself are part of the show. We have been unleashed like 6 year-olds with finger paints. 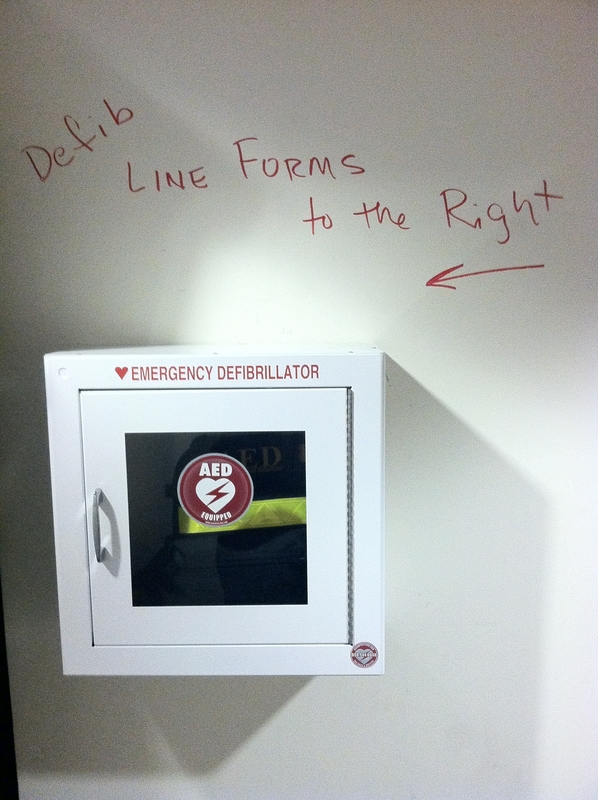 The old building had its quirks. There was only one elevator that actually took you up to the 7th floor cafeteria. 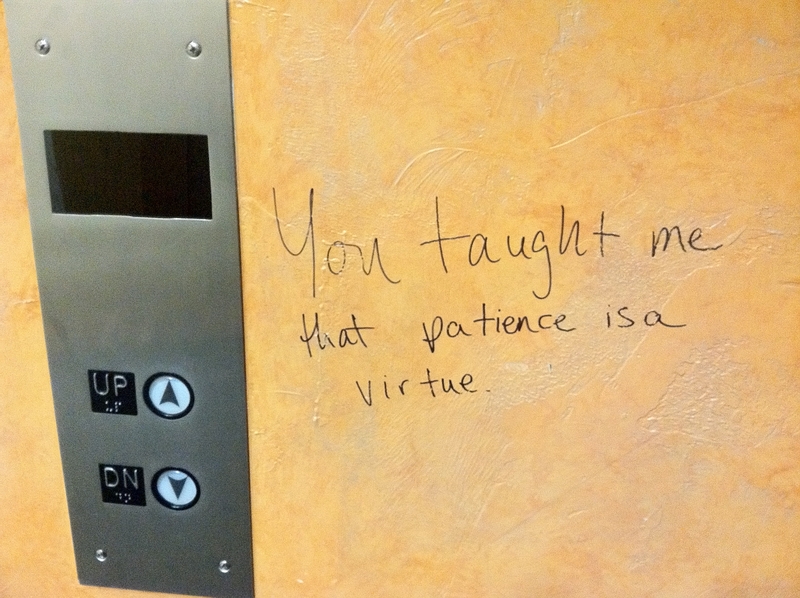 All other elevators took to you to the 6th floor and you’d have to walk up a flight of stairs. But that one elevator that went all the way up was also very, very popular. It could take up to 5 minutes or longer before you’d hear the cheesy little bell that signaled its arrival. 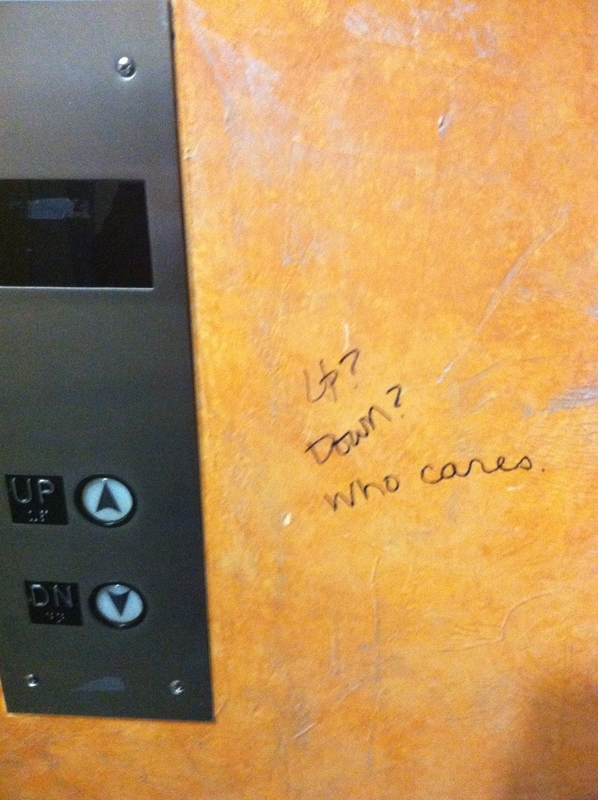 This is one of the other elevators. It featured a special guest rider all Friday afternoon. 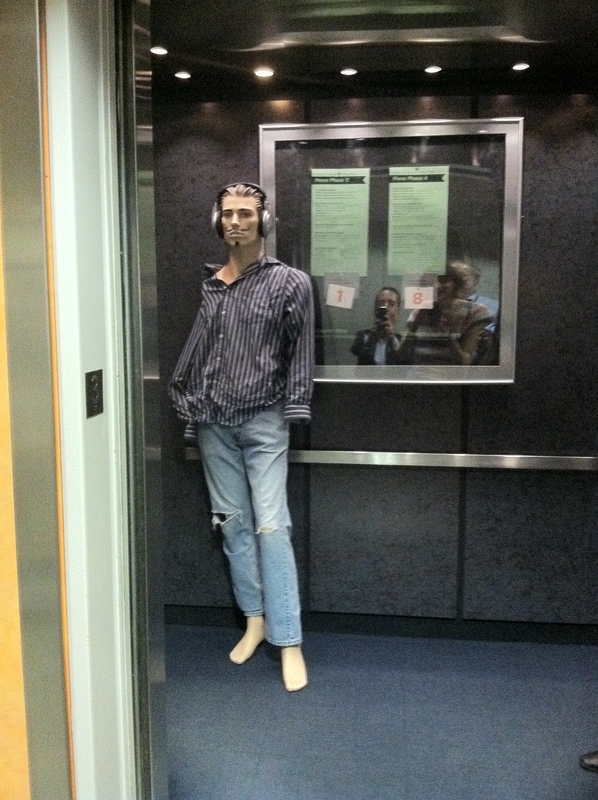 I maintain we are the only major radio network in the world with a headphone-wearing mannequin. 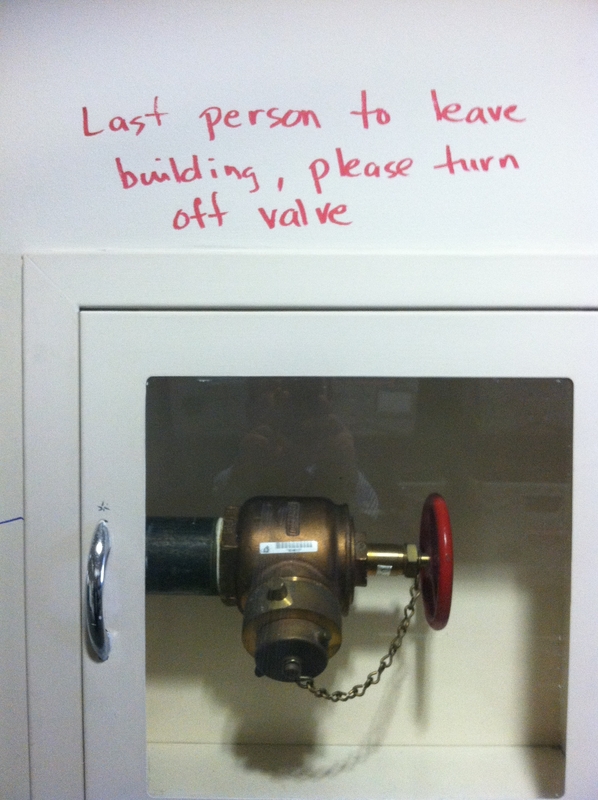 We always wondered what this old 3rd floor valve did, exactly. And we still wonder but just to be on the safe side….